Custom Metal Inset Frames are recessed from the edges of the print so the photo when hung appears to float 3/4 inch away from the wall. Inset frames are available in silver or black with a wire hangar. This type of mount is ideal for the Custom-Sized panoramic photos. 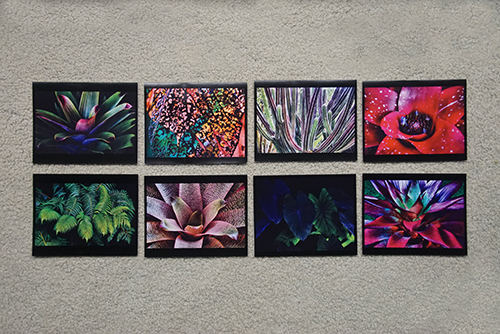 Note Cards are 41/4 x 51/2 inches, printed on standard semi-gloss card stock. The cards are blank inside to be used for thank you notes, friendship notes, condolences, or your own personal expressions. Cards are available in two sets of four, Bromeliads or Plants, with envelopes, tied in a set with rafia. Card sets are shipped in bubble-wrap envelopes. Pricing for note cards includes shipping. 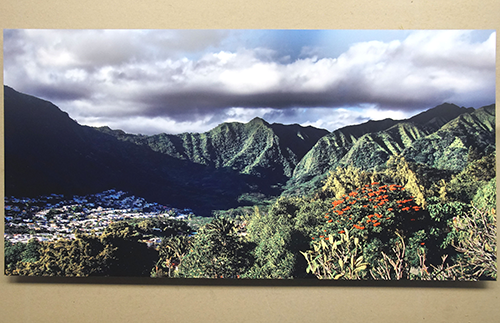 We supply only Metal and Canvas photo prints as they are completely washable. In Hawaii we live with Gecko guests year round and they leave daily 'presents' during their visits which is wy we prefer washable. Any surface problem can be eliminated by washing the surface with a sponge and water. Inks on both Metal and Canvas are fused into the surface and the canvas prints have an additional laminate coating that is also washable. If you do not have Gecko visitors, you probably have dust or mold. The photos we supply do not have to be covered with glass and display a beautiful viewing experience uninterrupted by reflections. If you have questions, please call 844-238-5052 24/7 or email info@HawaiianVisions.com. If you are interested in larger sized photographs than the sizes listed, please send an email to info@hawaiianvisions.com or call 844-238-5052 and we will quote pricing, crating and shipping. Please view the photos of all of the mounting options in this section of the website store. 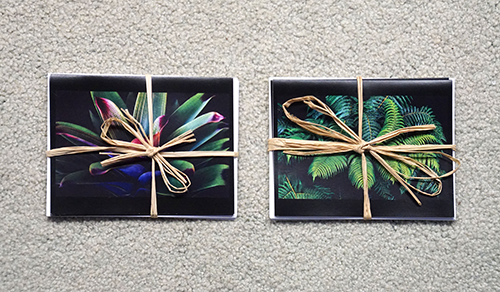 Gallery Wraps are made by wrapping a Canvas print around an interior wooden frame with an open back and installing a hanging wire. Float Mounts have a 1/2" Metal standout base of gatorboard with a metal back and hangar slots built in. The metal print is 1/8" thick and is glued to the float base. Exhibit Mounts are designed specifically for display in gallery shows and are printed on Metal mounted on 2mm Styrene backed with an inset metal frame and hanging wire. These mounts are made to be very durable and transportable. 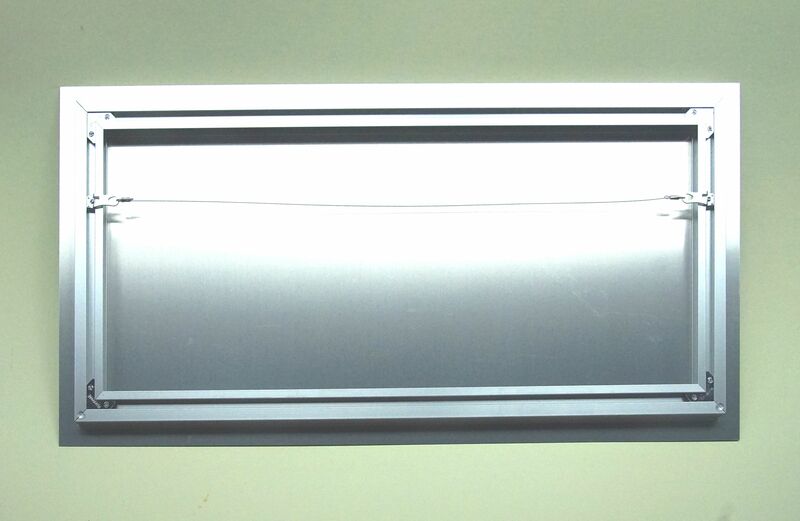 Inset Frames are all Metal black or aluminum frames with cleated corners and a hangar wire across the back of the frame. The photos we supply do not have to be covered with glass and display a beautiful viewing experience uninterrupted by reflections. If you have questions, please call 844-238-5052 24/7 or email info@HawaiianVisions.com. Because of time difference we may be closed when you call. We do promise to get back to you the next business day.